Parallels received its first iPad Pro the other day, and I was able to use it for a few days. Man that screen is big! The first thing I did was to install Parallels Access (version 3.0.2) from the iTunes App Store, and check out how well it works. I tested Mac apps, Windows apps, the Magnifying Glass, File Manager, gestures, selections, changing resolution, the keyboard, the tutorial screens, the App Launcher, landscape and portrait orientation, etc. 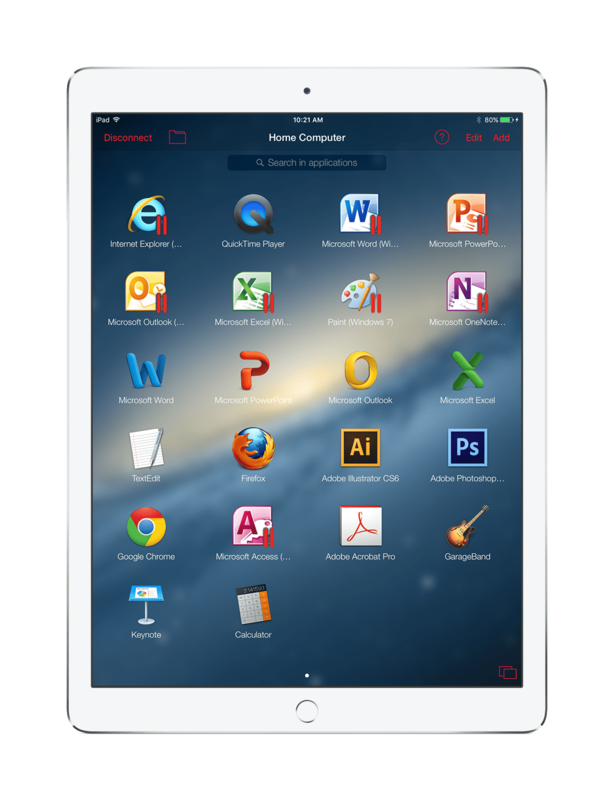 Basically all the features I show in my standard demo of Parallels Access. With only one exception, everything seemed to work just fine. I did not have an Apple Pencil or physical keyboard, so I could not test either of these this time. The one thing I couldn’t do despite about a half dozen attempts was extending a text selection in Word by “grabbing” one of the selection “pins” and enlarging or shrinking the selection. The real QA engineers on the Parallels Access development team are checking this out now, in order to determine if this was my error, something specific to the iPad Pro that I used, or an issue on this new iPad model that needs to be addressed by the development team. When I have an update from the team, I will update this blog post. 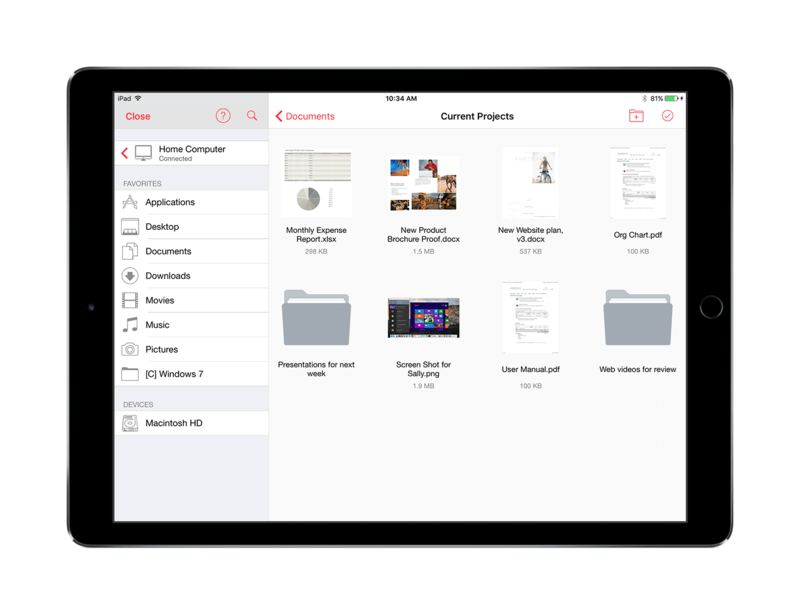 In the meantime, here are some screenshots of Parallels Access on the iPad Pro. Did I mention that the screen is really big? Figure 1: Word for Windows in landscape. 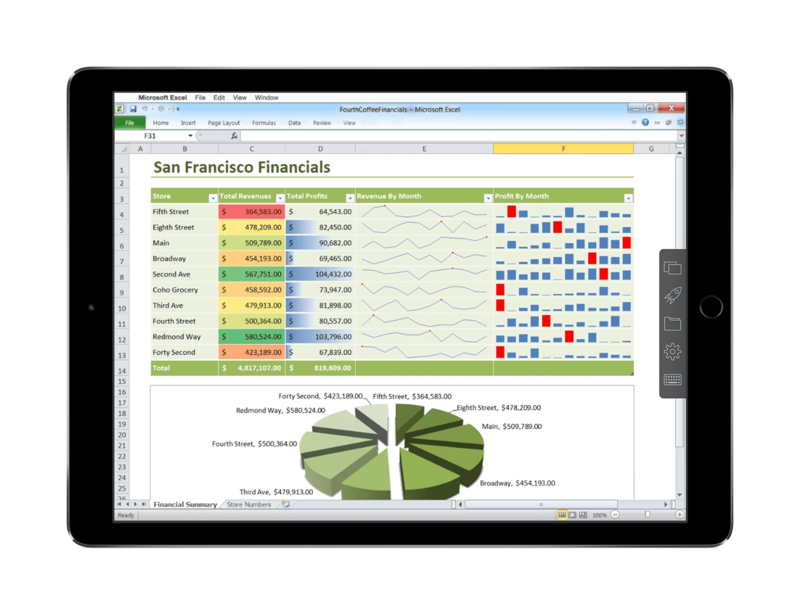 Figure 2: Excel for Windows in landscape. Figure 3: App Launcher in portrait. 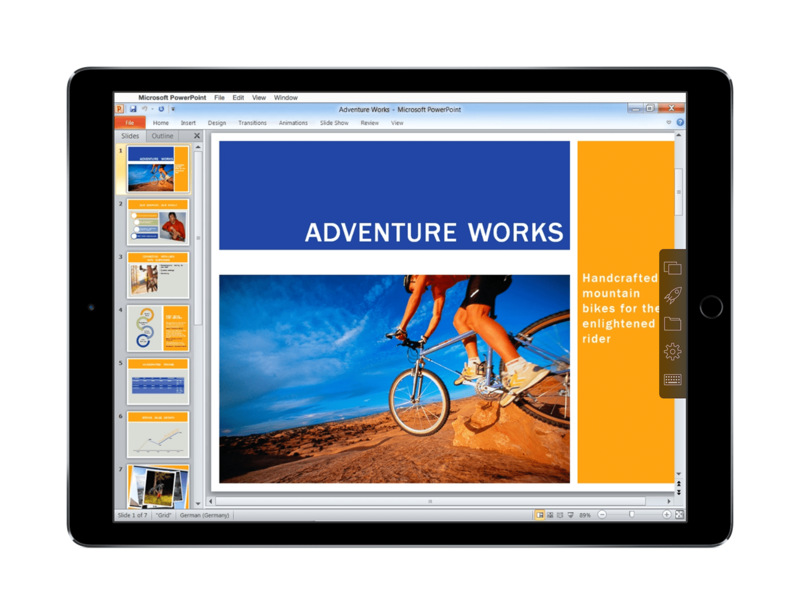 Figure 4: PowerPoint for Windows in landscape. 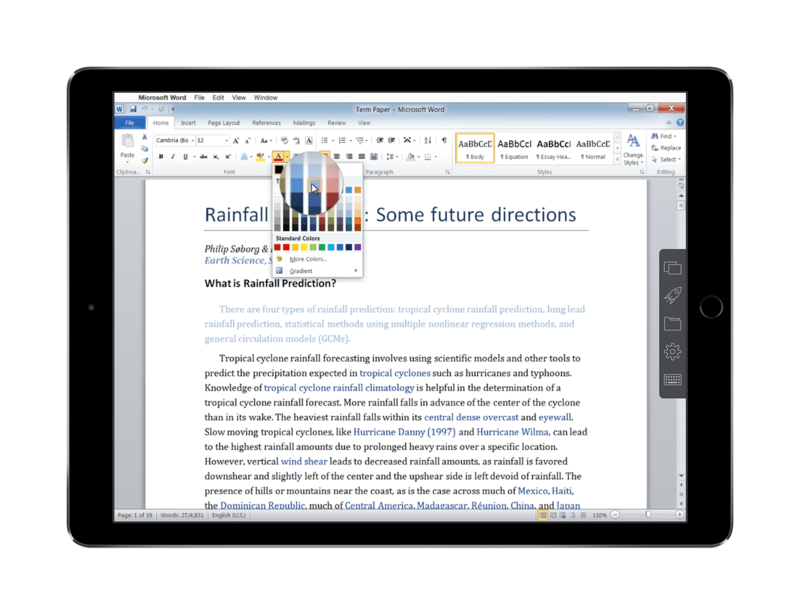 Figure 5: Word for Mac in landscape. Figure 6: File Manager in landscape. 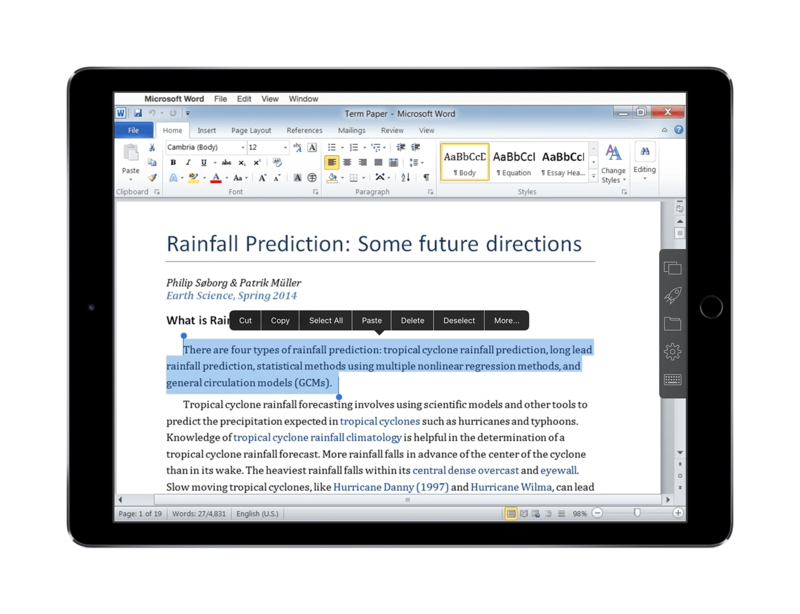 Figure 7: Magnifying Glass in Word for Windows in landscape. So glad you are starting to test on the iPad Pro. When using the official Apple keyboard, Parallels Access doesn’t work/let you type. I am sure you all will fix this, but in the mean time, I’m blocked. 🙁 If you update Parallels to take advantage of the huge screen, fix the keyboard, and maybe even pipe in Apple Pencil so that it works as a mouse pointer (or better yet a virtual Windows Ink pen), you will have the killer app that may make me rarely pick up my Windows PC at home!!!!! Thank you for a great product! Thank you! I’ve gone ahead and sent your comment onto our dev team so they are aware of the issues you’re mentioning. Plus, they love hearing feedback! 🙂 Thanks again for your comment, and we’re so glad you love the product! I second the first comment and would be happy to speak with the team if helpful. I’ve been using Access with the iPad Pro for a few weeks, and generally it works ok. I could really use the increased real estate, though – right now it’s just a stretched iPad app. Regarding the keyboard issue, I’ve also seen that. It’s inconsistent, but generally happens when I bring the app to the foreground again. I’ve been able to force it to recognize the keyboard by bringing up the options bar and tapping the gear (settings) icon twice (in fact, I just did it again right now). But it’s annoying. FYI, the keyboard issue also happened when using my regular iPad Air 2 and an external keyboard. – I prefer to use the mouse pointer and the surface of the iPad as a trackpad because it’s more precise. There are two issues with this input method: 1) the left/right mouse buttons get in the way at the bottom of the screen, and 2) mouse movement is currently 1:1 with finger movement. Trackpads are generally proportional in some way, so I don’t have to move my finger so far. This would be a great improvement (or you could support external mice/trackpads). – The option to change resolution (Gear icon -> Desktop Resolution button) doesn’t work consistently. I change the option (preferring my laptop resolution on the iPad Pro because of the large screen), but nothing happens in Access. Sometimes it will work when I then log out and in again or restart the app, but I shouldn’t need to do that. Fixing the above issues will result in a much nicer experience. Thanks! Hi Ricky – wow, thanks so much for all of your comments! I’ve gone ahead and forwarded them onto Kurt and the rest of our development team. 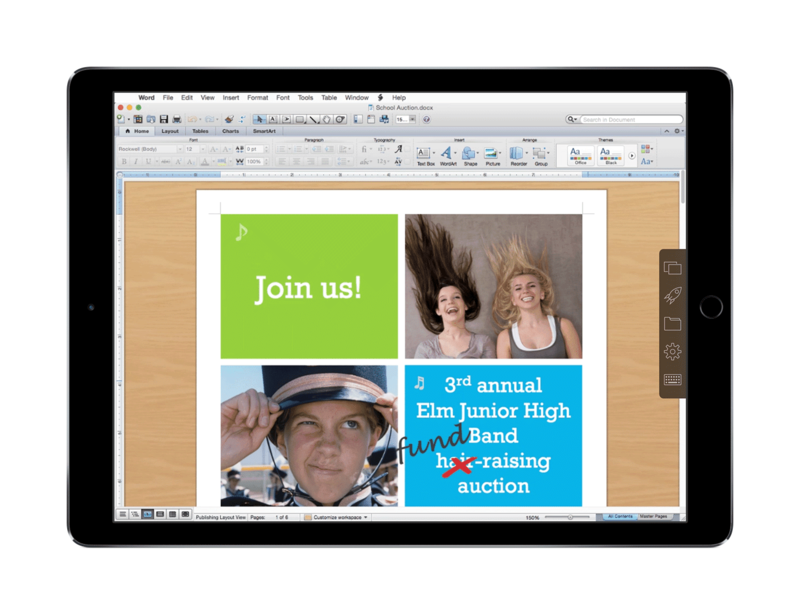 They’ll really appreciate your thoughts and experience with Parallels Access. Again, thanks so much! Hi Mihkel – thanks for your feedback and your feature request. I’ve gone ahead and sent your comments onto our engineering team. We appreciate your input! Thanks again. Hi Norbert – our team is currently still testing the Apple Pencil, but stay tuned! We should have some news to report fairly soon. Thanks for your comment! Hi, just been experimenting with Access on an iPad Pro with the Pencil… I was trying it with a 3D program on the Mac called Rhinoceros. Rhino normally lets me select by left clicking and dragging the mouse, or, rotate the view by holding the Ctl+left clicking and dragging, or I can pan by using Shift+Ctl+Left click drag or zoom with Ctl+Cmd+left drag however when using Parallels Access (and trying these key combos with the hockey’s as well as an attached Bluetooth keyboard), a single finger touch+drag (or dragging the Pencil) seems to equate to scrolling a mouse wheel instead which seems kind of weird and not very useful. Can you please pass feedback on to the engineering team. I’ve also tried it using a different type of screen sharing app called Astropad and it seemed to work much better with the Pencil and finger working properly. Hi Andrew – thanks for your feedback! We’ve already passed your comments onto our dev team. Thanks again!